(UKWMS-10/08/2018) – The expression that technology is like a double-edged knife is no longer just a figurative speech. Indonesia is now entering the 4.0 Industrial Revolution. That is, now is the era of digital technology. Inevitably, digital technology has revolutionized the whole life, and gave birth to a new civilization. Various transportation, shopping, and financial and banking services are competing to provide digital version services. Some examples of how chaotic can technology be will be buying food which can now be done through phone applications, or ordering motorcycle pick up and transportation service using online system. Shopping doesn’t need to go to the mall anymore, just through a website page, as well as booking travel tickets through smart phones. Even a robot innovation that resembles humans have now appeared and can replace the role of a partner. Addressing this and so that students know firsthand the situation on the field, the Graduate School of Widya Mandala Catholic University of Surabaya (WMCUS) held an inaugural lecture for new students. The topic was Leadership and Human Resource Management in Business Entities in the Age of Technology Disruption. The speakers presented were the Director of PT Bank BPD DIY Drs. Bambang Setiawan, Ak., M.B.A., accompanied by the moderator Dr. Mudjilah Rahayu, MM who is the Chair of the Doctoral of Management Science Study Program. “Who wakes up every morning and doesn’t first thing see a cellphone? This is simply because there is an alarm that wakes us up on the cellphone. Then there is bitcoin which can be an enemy of a government. It has been banned before. Why? Because it can become a new currency, even there is one of the cities in Europe that makes bitcoin an exchange rate. 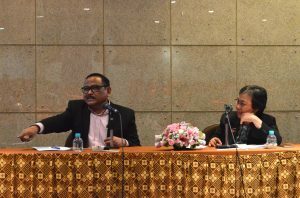 Banks are also now troubled by financial technology (financial technology-red), but in Yogyakarta, local offices are still needed and many people are still seen queuing, said Bambang when starting his material. A number of data related to the growth of internet users in Indonesia were described by him, including the beginning of the first industrial revolution. “We have entered the fourth industrial revolution, entering the digital civilization. Everything is digital, then what do we do? We have to be digital literate in order not to be left behind. This is inevitable due to we are already in the digital civilization,” Bambang explained. Bambang, a father of three children, also felt the difference when he was still undergoing education in the 90s in Uncle Sam’s country where people taking train were still chatting with each other. But when he visited his son who was studying in the Ginseng Land in 2018 and went around using the train, all passengers were looking down at their electronic device. In other words, no one was chatting anymore. Through that experience, we can reflect on how technology has disrupted our life. It is different in Yogyakarta where there are still many people waiting in line, including in banks, because there are many retirees from the baby boomers era living there. “We urge many of them to switch to the online system when sending money and we teach them how to do it, but they feel uncomfortable if they do not see directly when putting their money into the bank. This is why branch offices are still being opened. But don’t be happy too fast if you see many people are queuing up in banks. Take a look at the age of people who are queuing? The biggest threat for banks is fintech. We along with other banks also request the Financial Services Authority or OJK for banks to have fintech,” Bambang explained. The existence of technological disruption seems to create a new spatial competition, one of which is the boundary between industry sectors. For example, Go-jek is not a transportation industry because it doesn’t own a single vehicle, and the same with the fact that Tokopedia doesn’t have a physical building; but both have platforms to sell their products. Not only that, the disruption of technology has also shifted the way old businesses, such as the condition of several shopping centers, that have been neglected due to minimal amount of visitors, fax machines that have begun to be put away because sending documents and greeting cards can be directly done through social media. So what about the leadership and management of human resources in this digital civilization? “Deloitte’s research in 2017 explained that 86 percent of the CEOs interviewed said we should be prepared to face the 4.0 industrial revolution. So digital literacy first, and then later think about what we can do. 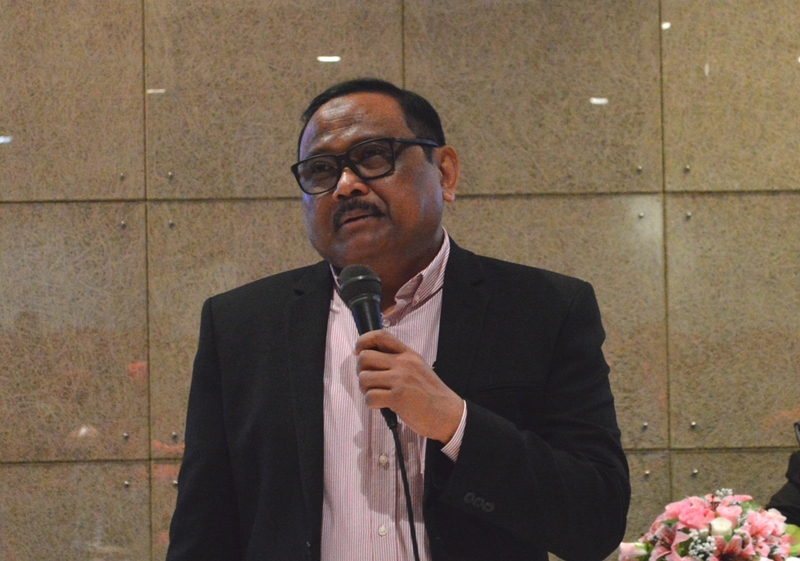 “We must change the mindset in making a long-standing decision in the future; we have to be fast,” said Bambang. Digital literacy was carried out at the BPD bank that he led. Digital transformation is not an option, but a necessity to survive in the competition of bank industry. In total, there are three transformations that have to be carried out before heading towards digital transformation, namely the transformation of work culture, vision and mission of organization, and business processes. “What is currently running is digital, because the choice is innovation or death. In the future, we want that customers be able to apply for credit through online application, and then the bank will come to the customer because it can’t yet be like fintech. Because the previous banking principle was changed by this fintech, so it is necessary to collaborate with fintech so that it will not be eroded, until the OJK allows us to create it,” he explained. Similar to MSMEs, if they don’t change, they will be defeated by malls and online shopping, so the DIY BPD bank facilitates this by establishing the jogjalapak.com page.